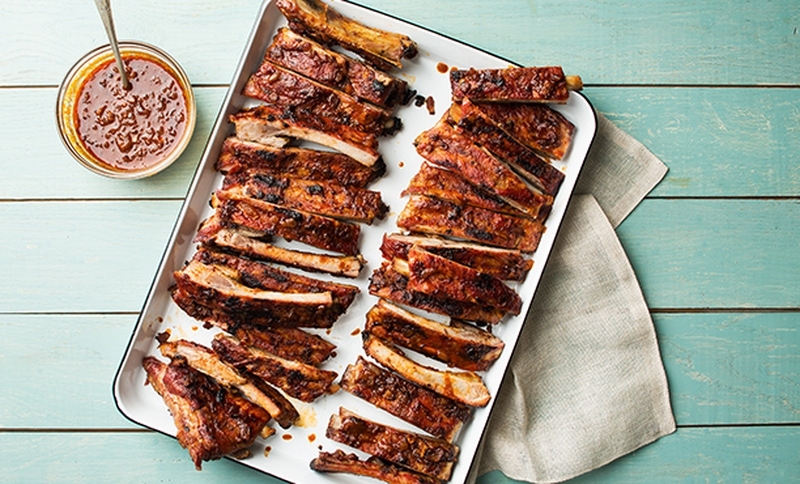 No matter the way that you cook ribs, you will want to have the best barbecue sauce to use during the process. Most of the top sauces are sticky and thick, allowing them to stay on the ribs. Many rib sauces are tomato based, but you can find a great deal of variations. If you use a sauce containing sugars (including tomatoes), keep in mind that it burns at any temperature over 265 degrees Fahrenheit/74 degrees Celsius. Therefore, if you want to cook at a temperature higher than this, don’t apply the sauce until the ribs have been cooked, which will prevent burning and help you avoid making blackened ribs. The following sauces are all great options for the next time you cook ribs. Put the vegetable oil in a medium pot on medium heat, adding the garlic and onion. Cook 6 or 7 minutes until the onion gets golden. Add a teaspoon salt, 1 cup water, and the tomato sauce, ketchup, vinegar, brown sugar, Worcestershire sauce, molasses, mustard, tomato paste and garlic powder. Boil the mixture before lowering it to medium low to simmer. Cook 15 minutes, so the onion becomes tender, and then add the liquid smoke. Strain the sauce and remove any solids. Mix your wet ingredients together. Add in the bouillon cube after crushing it. Crush the celery seed and rosemary leaves before adding them. Add your leftover dry ingredients and thoroughly mix. Let the mixture sit in the fridge for an hour. Mix all of your ingredients together within a saucepan that is placed on low heat. Simmer the mixture for around 20 minutes, stirring it occasionally until the sauce will not be watery but still thin. Let it cool before putting it inside an airtight container, so you can refrigerate it. For optimal flavor, let it sit a full day. Mix water and sugar in a pan, simmering until the sugar dissolves. Add the remaining ingredients and simmer for 30 minutes on low. Paint the mixture on the ribs in just one layer. You can caramelize the sugars by putting the ribs on high heat, but be sure to watch carefully to prevent burning. Add orange zest on top. Put a saucepan on medium heat to melt the butter. Add the garlic and onion, sauteing until brown. Add the rest of the ingredients, with vinegar last. Reduce the heat and simmer on low heat for 20 minutes. Let it cool. You can also puree the sauce. Melt the butter on medium heat in a saucepan. Add garlic and onion, cooking for 3 minutes until translucent. Add vinegar, boiling around 4 minutes until the mixture appears similar to wet sand. Whisk in mustards and jam/preserves. Simmer and whisk for around a minute until the jam melts. Take the pan off the heat before stirring in salt and bourbon. Server responsed at: 04/21/2019 10:44 a.m.